The Lake Forest Swim Club is a private year-round USA Swimming program wholly supported by membership fees and the fund-raising efforts of our members. We are a swim club with high goals and ambitions constantly seeking "Excellence in Action In All We Do". We value health, fitness, sportsmanship, citizenship, honesty, integrity, hard work, discipline, teamwork, and fair play. Our program strives to provide a safe educational environment to develop these life qualities through sport. The "LFSC Way" allows swimmers age 5 and older an opportunity to progress at their own developmental rate. Swimmers are placed in a practice squad based on the age, ability, experience and their willingness to meet the commitment expected from the squad. Our Age Group program is skill oriented with a gradual increase in the emphasis on physical conditioning. The Senior program progresses in a similar fashion with an increase in both physical demand and commitment. 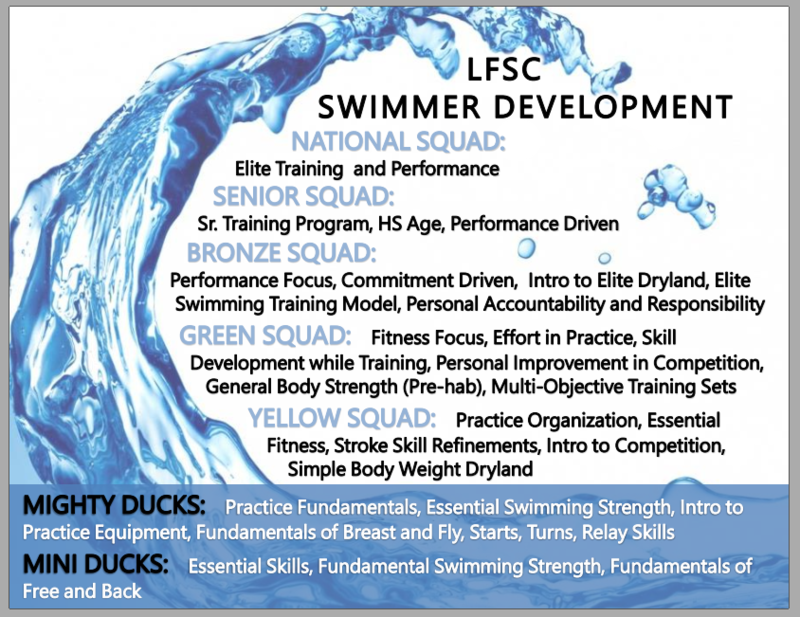 The "LFSC Way" emphasizes the progress of each swimmer on an individual basis as they gain strength, skills, experience and maturity. It is important to remember that children grow and develop at individual rates and long term athletic success requires great patience. The "LFSC Way" introduces competition in a progressive manner of time commitment and competitive demand. We have developed our own competitive ecosystem starting with our Age Group Challenge Meets, progressing from intra-squad to club to championship meets. We believe in development of all strokes and learning to compete in the full range of competitive events. The "LFSC Way" has successfully developed swimmers to all levels of swimming without overly focusing on championship swimming. LFSC swimmers are successful with all strokes and race distances, preparing them for successful high school, college, and Masters swimming. Every swimmer is not an Olympic swimmer but every LFSC swimmer receives world-class coaching and individual attention to their development. "Many people reach their goals but few reach their potential" is a much repeated coaching maxim. We are proud to have seen The "LFSC Way" successfully help hundreds of young people reach both. The chart below spotlights the character, skill, practice and performance focus of each LFSC Squad. Scroll down for more information about each squad.